Coppell sweeps district track meet titles, capping it off with a thrilling finish. Going into the last event of the night, the 4×400 meter relay, the Cowboys needed to finish at least third to clinch the district 7-6A title and the relay team consisting of juniors Matt Dorrity and Alan Huo, sophomore Gabriel Lemons and senior Luke Conlon were to get the job done. The Cowboys won the district title, defeating arch rival Southlake Carroll by one point. 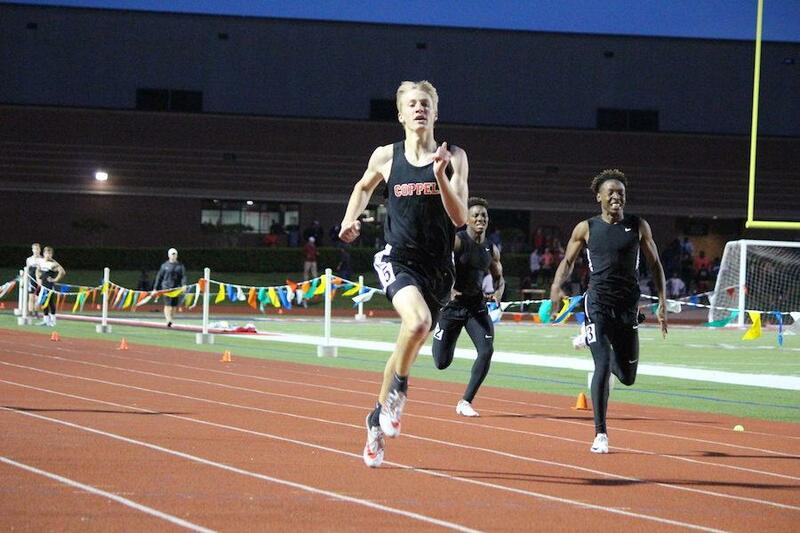 The 2016 District 7-6A track meet was held at Buddy Echols Field Monday and Tuesday and it was a very successful night for the Coppell Cowboys. The Cowboys and Cowgirls swept the district meet winning in all four divisions (JV Girls, JV Boys, Varsity Girls, and Varsity boys). “Winning District was definitely an experience I’ll never forget,” Dorrity said. “It was a great team effort that came down to the last race; and in the end, it was great to walk away with a victory against some great teams. The victory at district acts as a good confidence booster for us and I think we can use that to our advantage at area”. Though Coppell did not dominate the running events, both the boys and the girls had numerous first place finishes in the field events. Senior Colin Echols finished first in the boys discus, dominating the competition with a throw of 176-10.00. In the boys high jump, three Coppell athletes advanced to the area meet including freshman Pierson Greenlee, who placed first overall with a jump of 6-2.00. As for the girls, sophomore Rachel Okereke finish first place in the varsity triple jump. The Cowgirls also dominated in girls pole vault with the top three finishers all being from CHS. Rebecca Fuselier, Emily Pridgen, and Lauren Stukey finished first, second, and third respectively and will advance to area. 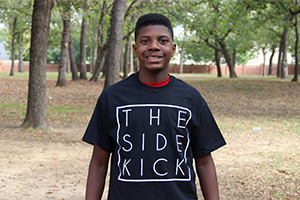 Though the running events did not provide as many first place finishes as the field events, there are still plenty of Coppell athletes who will be advancing to the area meet. In the 4×100 meter relay the Cowboys finished fourth with a time 42.80, while the girls finished second with a time of 50.01. In the varsity boys 800-meter run Coppell’s Alan Huo won the race with a time of 157.41. In the 4×200 meter relay the Cowgirls finished in first place with a time of 144.68, while the boys finished fifth. In the boys 100 meter dash three Coppell athletes were in the final, Freshman Justin Dinka, and Juniors Zach Dicken and Timmie Heard. Dinka finished third and will advance to the area meet with a time of 11.47, while Dicken and Heard finished fifth and sixth respectively. The Cowboys and Cowgirls will also be heavily represented in the 400-meter dash. In the girls 400 junior Lauren Cunningham finished second with a time of 100.47, while sophomore Bryce Utter finished fourth. In the boys race, junior Zach Dicken finished second with a time of 50.03, Dicken also finished third in the 200 meter dash running a time of 22.87. Coppell High School junior Lauren Cunningham sprints to the finish line at the end of the women’s 4×200 relay. 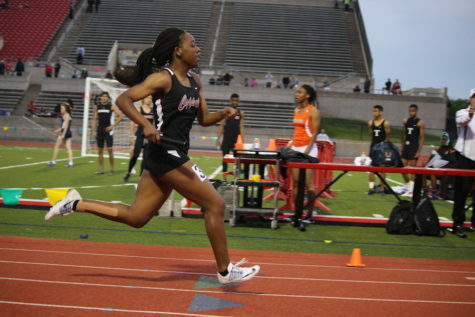 The District 7-6A Track & Field Meet was held at Buddy Echols Field and athletes from all over the district participated in events on Monday and Tuesday. Photo by Kelly Monaghan. Finally, the mile relay and, for the Cowboys, the district title was on the line. The Cowboys needed a least a third place finish to clinch the district title. It was a test but in a thrilling race the Cowboys were able to answer the test finishing in third place with a time of 3:26.83 and win the 2016 7-6A district title. As for the girls, they were able to finish third in the 4×400 with a time of 4:06.73. “I am really proud on how our girls ran tonight, they competed well and it resulted in a district championship so hats off to them and we hope to continue this success at area,” Coppell head coach Nick Benton said. Up next for Coppell Track is the Area track and field meet next Thursday here at Coppell High School.